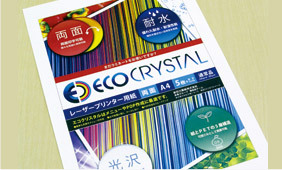 At Tomoegawa USA we carry a full line of specialty papers including ECO Crystal, water resistant laser printer paper. It's ideal for use as retail store price cards, menus, POP advertisements, name tags, banners, and much more. ECO Crystal features a durable glossy and printable finish on both sides, while maintaining the same laser toner adhesion of regular laser paper. ECO Crystal paper features resistant to water, extreme cold, and heat, as well as UVs. Its PET film lamination creates a product that will not tear, and can be recycled in a normal paper waste stream. Available in standard sizes with 250 sheet minimums, and immediate shipment. Special sizes are available and require 3000 sheet minimums, 1.5 month lead-times. Max 1080mm wide, 300 meters long. Categorized as "paper" (Paper is the highest content of this product).